Hello and Welcome to Leap Joy Inflatables here in lovely Statesboro, GA! The summer is coming to a close and we are now setting our sights on the fall season and the fun it has to offer. There will be lots of parties and festivals to celebrate the holidays, school, and changing of the weather. 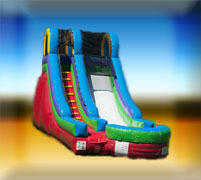 We have the perfect cool weather rentals; inflatable Dry Slide Rentals! When most people think about slides, they think of water, but our slides can be rented dry. They are just as much fun and they can be set up indoors, so you don’t have to worry about the weather. Click here to see out great dry slide selection! This is also a great time of year for concession rentals! Click here to learn more! Thank you for choosing Leap Joy Inflatables for your Inflatable Dry Slide Rentals! We have been serving the great city of Statesboro, GA since 2006. Our customer’s satisfaction is our top concern and we work hard to ensure you are a customer for life. Delivery is always free within 20 miles of Statesboro! Click here to learn more about our rentals and affordable prices.